Today we’ll put the Acer Aspire E5-575G-53VG under the spotlight. The Acer family is as well-known as it is extensive so the competition is stiff for this model. It’s got a lot going for it on the surface – let’s see what the fuss is about. Remember the old movies where phones were the size of bricks? Laptops were the same until recently! The age old issues of circulation and the size of hardware caused our favorite portable units to be thick and heavy, an inconvenience at the best of times. Thankfully as technology marches on wards we are seeing slim and beautiful designs pushed out that can still stay in the ring with the latest AAA games and programs. After testing there are a few distinct points to note with the display. The Acer Aspire E5-575G-53VG has great black levels which helps make those dark tones suitably moody and thick but it loses out in the subtlety. We found it tricky to separate similar dark tones which can be a struggle for certain games or movies which make heavy use of moody lighting in areas. The good news is the accuracy of the colors is spot on. Acer ColorBlast technology gives you 94% NTSC (more than twice as many colors as the average laptop) for superb colors that are extremely close to that of the source image. The Laptop also has BluelightShield feature which reduces blue-light emissions, allowing you to game longer without eyestrain and fatigue. 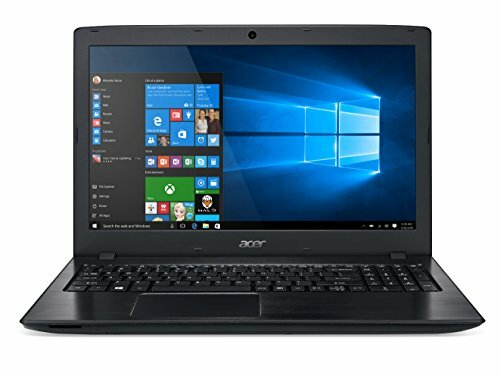 The finish on the screen is somewhat grainy and the viewing angle needs to be specific to get the most out of the screen but we found that these criticisms are minor and mainly noticed by the hard-core enthusiast – it certainly matches against other laptops in the price range admirably. The kind of price range you are looking at for reasonable improvements to these areas is a lot higher with it ultimately coming down to very expensive internals that drive the price up. Great news on the sound from the speakers. Not tinny at all, great depth of bass and clarity of sound. That’s a critical factor for any laptop whether you want the booming bass of a machine gun firing in a Battlefield game or the subtleties of different instruments in music. This is capable by what Acer considers a one of a kind speaker design which limits audio distortion, delivers wide range bass, and allows you to boost the volume so that it fills the room. We enjoyed putting this one through its paces with a variety of challenging audio. An average score here, a common theme with many powerful laptops designed to be pushed. It’s got good scores when it isn’t being used – the idle sound is almost completely quiet and the internals run at a low temperature when not under load. That all changes when you start to push the thing. After doing a first set of benchmarks and a few minutes on our favorite games it was quickly found that the fans kicked up and started making a smooth but nevertheless noticeable sound. This wasn’t the clunking whine of a clogged up fan, far from it. A perfectly healthy running noise occurred that was nevertheless quite distinct. This brought us to the curse that all laptop owners know – the heat. After a session of reasonable length, the CPU was running at nearly 80 degrees with the GPU at 90. Not an immediate melting issue but certainly a factor that you need to keep in mind, you can’t cane this laptop hour after hour and not expect sluggishness or slowdowns. A sadly consistent theme of many laptops nowadays that seems to be tough to solve.